Step back into the 1880’s with Dad this Father’s Day with muskets, pistols, bows and arrows - and even a blacksmith! Spectators of all ages will enjoy two performances from the Red Mountain Renegades! With pistols, shotguns and rifles these cowboy action shooting shows will take you back to the days of the Wild West. 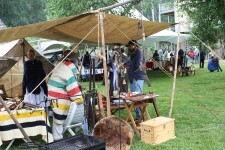 The Fraser Valley Frontiersmen will be on site demonstrating antique firearms, primitive archery & tomahawk throwing. There’ll be a Trader’s Row with vendors, spinners and weavers and live music. Plan to stay the day as Father’s Day wouldn’t be complete without a sizzlin’ barbeque! If you prefer a sit down meal book the whole family into our café for a Sunday favourite, traditional Roast Beef & Yorkshire Pudding with mashed potatoes, seasonal veggies and gravy.